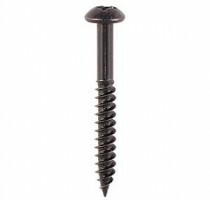 A traditional woodscrew designed to give rapid installation into softwoods. This fixing is also ideal for use with a plastic plug when fixing into masonry. The round head thread is ideal for clamping to flat surfaces or achieving a high aesthetic appeatance. Partially threaded from 1.1/4" and above the screw is produced from C10-18 steel and plated with Black Japan finish. With 60° twin threads and a 25° sharp points, these screws ensure faster insertion, greater pull out resistance and increase thread acceptance.